Despite just celebrating her fifth birthday, better things look in store for Laurel Oaks’ lightly raced Fastnet Rock mare Kentucky Diva following a dominant win in a benchmark 64 over 2100 metres at Sandown Lakeside on Sunday. 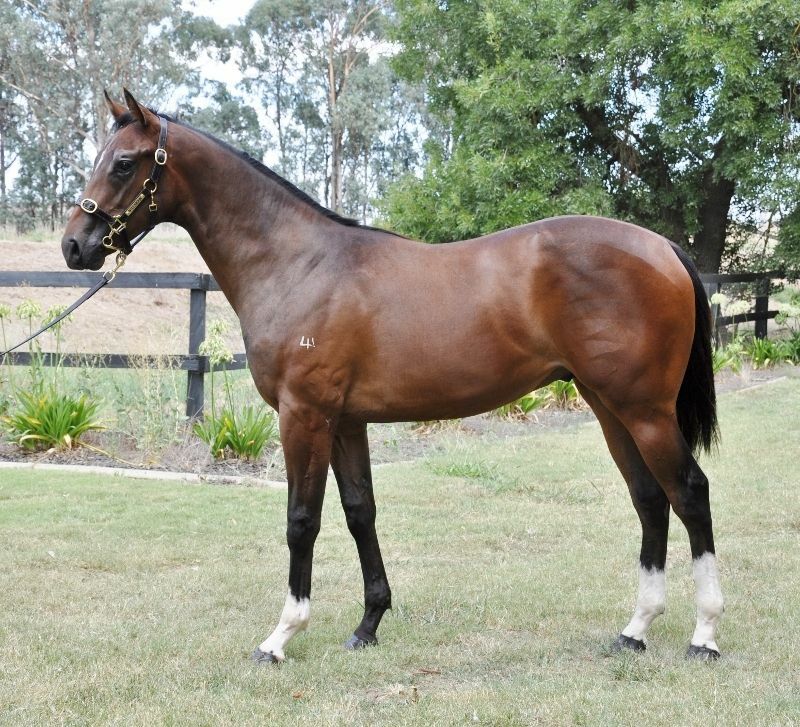 The veteran of just four starts, the Team Hawkes-trained mare (pictured as a yearling) was given a picture-perfect ride by Dwayne Dunn to defeat Romelo (Ekraar) by one and a quarter-lengths with Ayers Rock (Nicconi) three lengths back in third. The winner of a 1600 metre maiden at Hawkesbury on June 21, Kentucky Diva was coming off a luckless sixth at Warwick Farm at her most recent start. “She’s only had a handful of starts, the owners have been very patient,” co-trained Wayne Hawkes said. “They bought a horse knowing that she would need a stack of time. “She never showed a lot from the get-go but she’s slowly starting to put it together. Purchased by Laurel Oak Bloodstock for $280,000 out of the Milburn Creek draft at the 2015 Inglis Premier Yearling Sale, the Makybe bred mare is the fifth foal and fifth winner out of the stakes-winning Jade Robbery mare Valkyrie Diva. Also, the dam of the stakes-winner Wales (Redoute’s Choice), Valkyrie Diva is a half-sister to the champion, 3-time Melbourne Cup heroine Makybe Diva, the Group II winner Musket and the Listed winner La Amistad. Valkyrie Diva has a 2yo colt by Zoustar. She was not served in 2016 and visited Snitzel last spring. Sir Bacchus boasts a win over Redkirk Warrior but while the latter has gone on to win three Group One races, the Chris Waller-trained gelding will be aiming for a first black-type success in in the Winter Stakes. Redkirk Warrior will run in the July Cup at Newmarket on Saturday while Sir Bacchus will be at home at Rosehill after getting into the field for the Winter Stakes (1400m) as first emergency. One of two runners for trainer Chris Waller, Sir Bacchus has been promoted to the field with Patrick Payne deciding to run Widgee Turf at Caulfield instead. Payne will still have Chamois Road in Saturday’s Rosehill feature while Waller also saddles up Invinzabeel. Sir Baccus’s win over Redkirk Warrior came in October 2016 in a 1200m-race at Moonee Valley in which another subsequent triple Group One winner Santa Ana Lane was fourth. While he hasn’t risen to those heights, Waller believes Sir Bacchus can make his presence felt with luck. “He’s going OK but needs luck because his get-back racing style makes it hard for him,” he said. Invinzabeel to be ridden by Blake Shinn, is a $6.50 chance while is at $18 with Jay Ford to ride. The John Thompson-trained Dreamforce was the $5 favourite on Thursday just ahead of stablemate Special Missile at $5.50. Dreamforce looked the certain winner of the Civic Stakes on June 30 before being claimed on the line by the Waller-trained Liapari to go down by a half head. Special Missile also loomed to win his most recent start before being overwhelmed late to finish third in a 1600m-race won by Karavali from Dark Eyes. Dreamforce will again be ridden by Sydney premiership leader Brenton Avdulla with apprentices’ front runner Rachel King booked for Special Missile. But if third emergency Flow gets a start, King will ride the Godolphin sprinter. Switched to Darley Victoria this spring, Golden Slipper winner Sepoy had a smart winner at Warwick Farm on Wednesday with promising filly Sweet Scandal confirming her potential with a tenacious win. The Chris Waller trained three-year-old filly broke the ice at her second start at Canterbury last month winning a maiden event over 1250 metres and was set a task for this assignment stepping out to 1300 metres for a Benchmark 75 event and taking on older mares. She rose to the challenge, leading all the way for Blake Shinn to win by a long neck in an encouraging performance. “She’s done a good job to go from a maiden to a benchmark 75 and taking on the older mares,” Waller said.”She’s taken a couple of steps today and that’s the sign of a progressive horse. “Blake didn’t go too fast, kept a good hold on her and it suggested to the other riders that Blake Shinn’s in front and he will roll along. “That’s a big thing for a horse. They like to know there’s something in their mouth, they’re not running flat out and when they do ask them to quicken, they can. With Sweet Scandal set to turn four in 22 days, Waller said ideally he’d try to find another suitable option before the July 31 end to the 2017/18 season to take advantage of the filly’s BOBS bonus scheme eligibility. 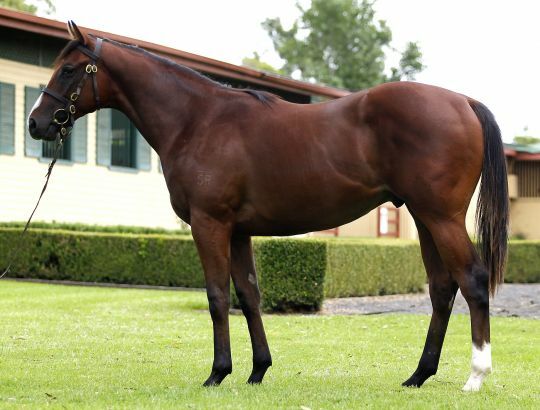 A $230,000 Inglis Easter purchase from the Widden Stud draft for Laurel Oak Bloodstock, Sweet Scandal is a half-sister to the very smart Chris Waller trained metro winner Sir Bacchus and is the second winner from stakes-winning Encosta de Lago mare Bacchanal Woman. 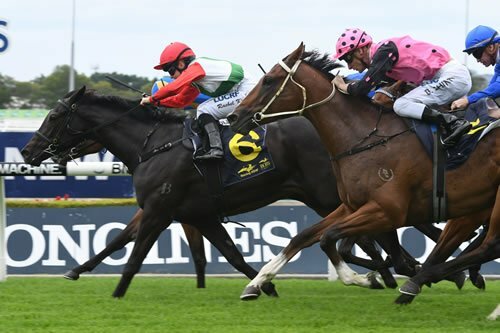 Rosehill’s Chris Waller produced the trifecta for the feature $100,000 Octagonal Handicap (1400m) at Rosehill on Saturday with Sir Bacchus, New Universe and Invinzabeel within 30 minutes of his stable winning the Group 2 PJ O’Shea Stakes with Egg Tart on the Sunshine Coast. 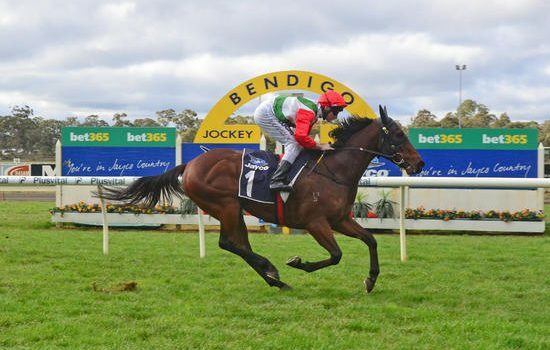 It has been some time since the five-year-old Sebring gelding Sir Bacchus saluted, October 2016 at Moonee Valley over 1200m, when he defeated the Royal Ascot bound Redkirk Warrior (GB), It is Written and Santa Ana Lane. Heady subsequent form lines indeed. 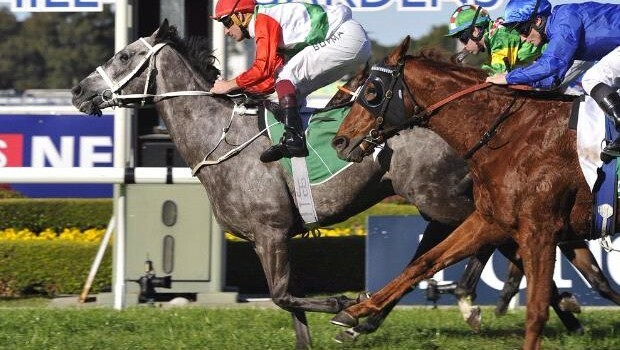 After a long time away from racing to rest and strengthen the stable produced him at Rosehill on May 5th for a fourth over 1350m and again on May 19th for a sixth over 1500m. Back at 1400m jockey Tim Clark settled back with Sir Bacchus (53.5kg) and then made a weaving run from the 300m that took right until the line to haul in the stablemates New Universe (NZ) (53kg) and Andrew Adkins and Invinzabeel (58kg) and Jason Collett racing out in the middle of the track. Once clear the grey stormed to the line and he now looks ready to add to his record of seven wins and two seconds from 23 starts. However, Saturday’s return to the winners stall caught punters out with Sir Bacchus paying $18.00 on fixed odds and $19.90 on the tote. The margins at the line were a half head to New Universe (Darci Brahma) and a long head to Invinzabeel (I Am Invincible). The $3.80 favourite Special Missile was fourth. The time was 1.24.37 on the Good 4 track with the final 600m in 35.01. 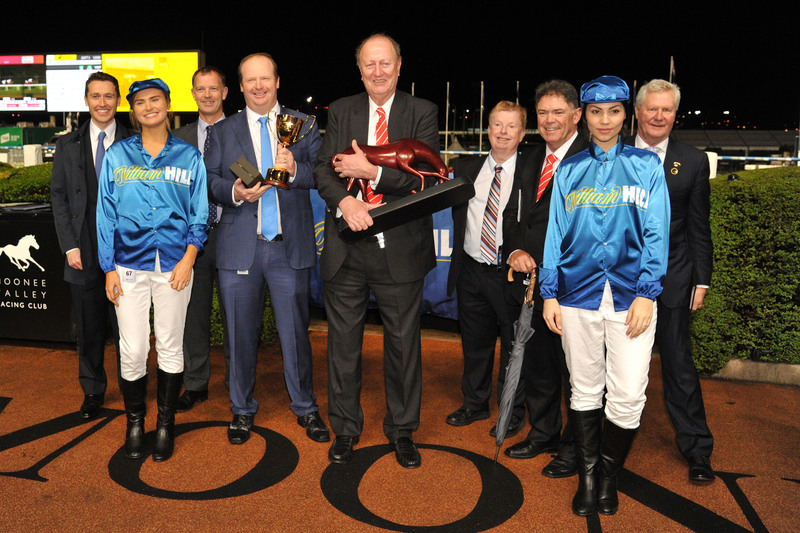 The win was number 161 for Waller for the Sydney season after two earlier wins on the programme. “I thought he had a terrific chance, the writing was on the wall last start. 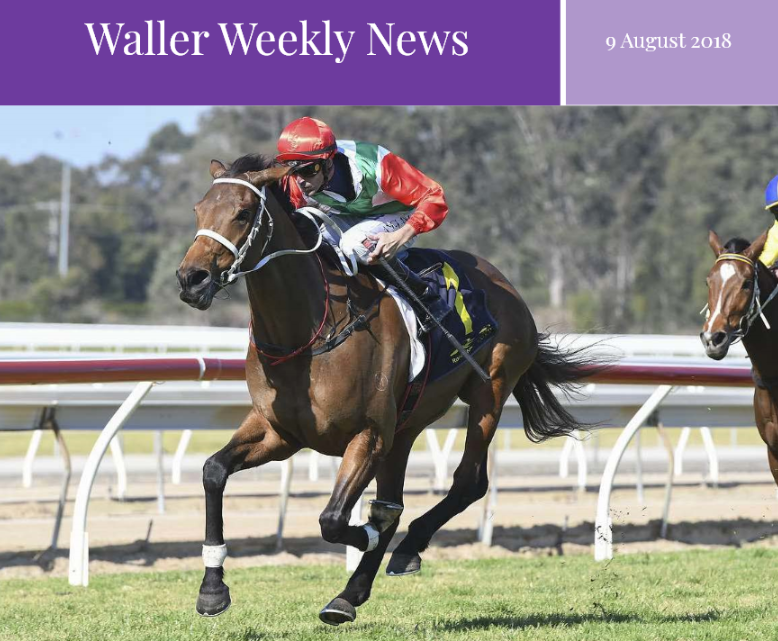 He had about six to eight months off and they always need a few runs to get back and I think coming back to 1400m helped as it might have a bit far last start,” said Waller. “Just getting him back to his best for now is pleasing and I think he will continue on with it,” he added. Sir Bacchus, out of the Encosta de Lago mare Bacchanal Woman, has now earned stakes of $465,250 for his ownership group Laurel Oak Bacchus, Boeara Holdings, Mr F W Cook, Mr S P Grant, Dirty Grey, Mr K Lowe, Mrs M P Lowe, Mr A W Reichard, Mr J T O’Brien, Club Bacchus, Mr M W Powell, Mr N Macdonald, Mrs R H Richards, Mrs C M Cook and Mrs E K Grant. Exceltic (Excelebration) is the horse Gary Portelli believes is his best chance for back-to-back Golden Slipper wins but he admits he faces a tough assignment at his first start. The colt is one of five acceptors for Saturday’s Canonbury Stakes (1100m) at Rosehill but standing in his way of a debut victory is the Chris Waller-trained Performer, winner of the Breeders’ Plate in October. Performer is the TAB’s second favourite for the $3.5 million Golden Slipper on March 24 and odds-on to win the Canonbury. But as Performer has eased from $1.50 to $1.60, Exceltic has been backed from $4.60 to $3.80 to upset the Chris Waller-trained colt. Exceltic’s debut has been delayed more than once with Portelli taking care to make sure he is at his best for his first start. He decided not to run him in the Breeders’ Plate and opted to take him out of a race last week, sensing he was not quite as he wanted him. “He has won all three of his trials and I have a lot of time for him,” Portelli said. Exceltic sports the white, green and red colours carried by the Portelli-trained dual Group One winner Rebel Dane who has just completed his first season at stud. The next chapter of the successful partnership between Gary Portelli’s stable and Laurel Oak Bloodstock is begging to be written by superbly bred debutant Picaro at Randwick on Saturday. Pierro’s strapping two-year-old son will contest the Tab Handicap (1200m) after an impressive trial, with Portelli eyeing off a start in the rich Karaka Million at Ellerslie Racecourse on January 28 should Picaro impress this weekend. Picaro is out of group 3-winning mare Sookie, and Portelli is hopeful the link with Laurel Oak will deliver his yard more success following the recent retirement of their most successful venture, Rebel Dane. He was a two-time group 1 winner and, while hoping to follow in his footsteps might be a tad ambitious, Portelli said Picaro had enough ability to carve his own reputation at the race track following his second to Burbank in a pre-Christmas trial. 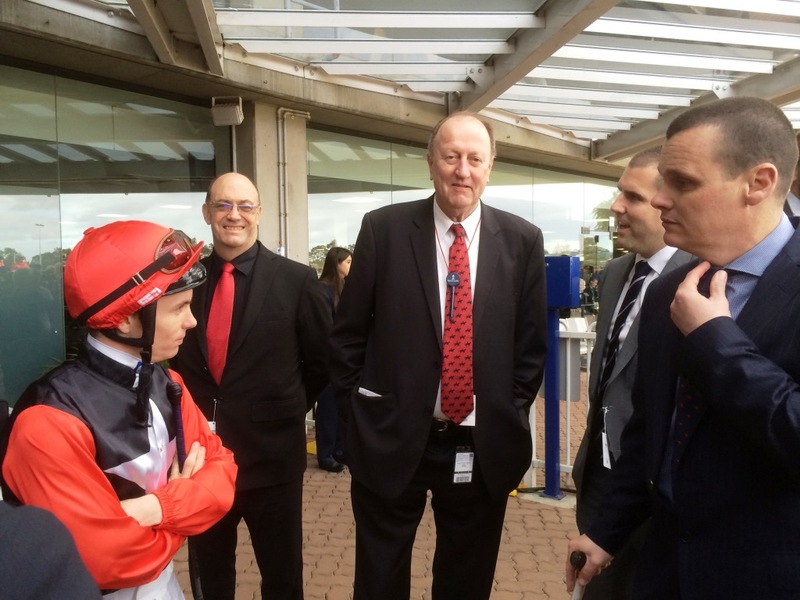 “The winner of Waller’s is a pretty good horse,” Portelli said. “There’s a big rap on him apparently, the winner of the trial, they like him a lot, he’s got ability. We’re looking forward at seeing [Picaro] run on Saturday. “Our guy has always shown ability, out of a good mare Sookie, fantastic family. “He’s got a good [pedigree] page, he was bought in New Zealand by Louis Mihalyka from Laurel Oak Bloodstock and we’ve had a lot of luck with Louis over the years. Warwick Farm-based Portelli will unleash several two-year-old debutants in the coming weeks as he declares his hand for this year’s Golden Slipper, which he won last year with She Will Reign. He rates Golden Gift (1100m) winner Secret Lady as the best of his juveniles so far this year, while Perfect Pitch, a Pierro filly also raced by Laurel Oak, won a race at Rosehill last month. “Secret Lady’s probably the one that’s the best of them at the moment but we’ve had a few trial probably in the last week or so that go all right,” Portelli said. “Next few weeks we’ll hopefully unearth something. “I particularly like to train the two and three-year-olds, I put a lot of time into their programs and their preparations and their feed and the trackwork riders put a lot of work into educating them properly and having them do everything right on race day. “It goes a long way, particularly if you’ve got a horse that’s bred to be [a performer at] two, you’ve got to make sure you give them every opportunity to race. Meanwhile, She Will Reign will resume in the Inglis Sprint (1100m) at Warwick Farm on February 10 before heading to Caulfield to contest the $500,000 group 1 Oakleigh Plate. She hasn’t raced since failing in the Everest. Opie Bosson is the new rider for last-start Group 3 Counties Cup (2100m) winner and Laurel Oak bred Maygrove in Saturday’s Group 3 SkyCity Hamilton Waikato Cup (2400m) at Te Rapa. The champion jockey takes over from Johnathan Parkes, who was aboard the Murray Baker and Andrew Forsman-trained Authorized seven-year-old for his wins in the Feilding Cup (2100m) and Counties Cup, who is ruled out on Saturday feature through suspension. Bosson, who married Trackside presenter Emily Murphy since last riding, returns to riding at Tauranga on Friday. “I’m looking forward to getting back. I’m a bit hungry actually and I’m looking forward to riding Maygrove again. He was tough at Pukekohe last time and he knows how to win a Cup,” said Bosson, who began a suspension on November 18. The Gary Portelli trained PERFECT PITCH was slowly away on debut last month when chasing home promising filly Gongs for third on debut at Canterbury, but took plenty of improvement from that outing in both fitness and experience. She raced up on the pace for Rachel King and fought on tenaciously to claim a head win in the 1100 metre dash over the favourite Miss Invincible. Perfect Pitch was a $100,000 Magic Millions purchase from the Southern Cross Breeders draft for Laurel Oak Bloodstock in whose colours she runs. Gary Portelli has intimate knowledge of Perfect Pitch, having trained the mother Absolutely Flying and half-sister Lipizzan for Laurel Oak Bloodstock. “I was pretty confident coming into today but no one wanted to talk about this filly,” Portelli said. “She had no luck at Canterbury, I think she should have finished a lot closer to the winner and she’d come on since the run. “What you saw today is probably just a taste of what’s going to come. Perfect Pitch is the second winner from Absolutely Flying, a placed Commands three-quarter sister to Group II winner Camporella from stakes-winner Really Flying. 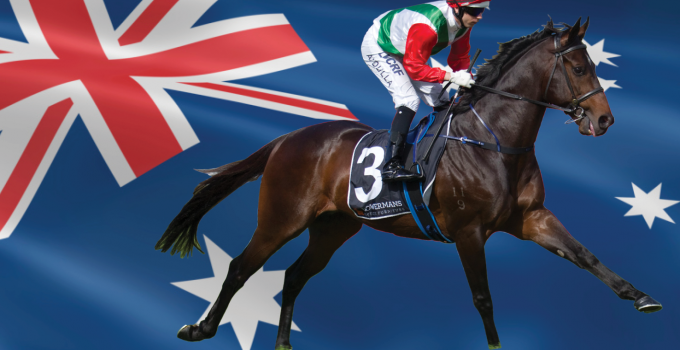 Coolmore’s Golden Slipper winning son of Lonhro is the leading Australian Second Crop sire with 18 winners of over $2.1 million highlighted by four stakes-winners Pinot, Levendi, Kentucky Breeze and Satin Slipper. 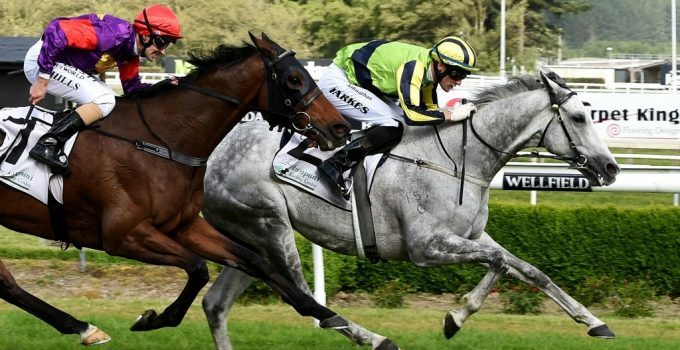 A $110,000 purchase at the Select Sale at Karaka, the Laurel Oak-bred, lion-hearted stayer Maygrove (Authorized) is becoming a king of New Zealand’s Cup races. 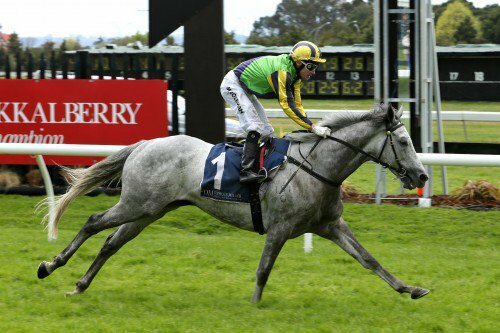 The gutsy grey’s trophy cabinet already included the Group 2 Wellington Cup (2400m), Group 2 Awapuni Gold Cup (2000m), Listed Feilding Gold Cup (2100m) and Listed Jakkalberry Classic (1950m), and on Saturday he struck again in the $100,000 Group 3 Ssangyong Counties Cup (2100m) at Pukekohe. A victim of his own success, Maygrove’s high rating has earned him a 60-kilogram topweight in the Fielding Gold Cup and Counties Cup in his last two appearances. But it hasn’t been enough to stop him. Trained by Murray Baker and Andrew Forsman and ridden by Johnathan Parkes, Maygrove sat in a handy position before surging into contention in the straight. In a desperate three-horse battle down the straight with lighter-weighted rivals Five To Midnight (NZ) (Domesday) and Promise To Reign (Manhattan Rain), Maygrove refused to surrender and lunged at the line to win by a short head. Raced by Lib Petagna’s JML Bloodstock Ltd in partnership with Patrick O’Rourke, Maygrove has now won nine of his 48 starts and more than $470,000 in prize-money. MONASTERIO followed a similar path to Bid Of Faith in that he ran an encouraging fifth first-up, was placed second-up, and then won impressively third-up. Second-up from a spell at Doomben, Monasterio drew the outside gate and had to go back to last in a 1600m race. Jockey Matthew Cahill was continually held up getting a run, and had to pick his way through the field, but when clear Monasterio motored to the line for a very good second that made many of the horses to follow analyses. On the strength of that impressive run, trainer Chris Waller decided that another run in the same grade over the same distance on the same track would suit him well, but once he drew wide again our optimism diminished. On this occasion though Matthew Cahill was able to push his way to the outside so Monasterio had clear running and once again he motored to the line, this time reeling the six-length deficit on the home corner to record an emphatic victory. We expect him to be better suited over further, and Chris is yet to decide whether he will run over 2000m on 9 December at either Doomben or Rosehill, or wait till 16 December for another 1600m run at Doomben. Coming back from a long injury layoff, BID OF FAITH put the writing on the wall with an encouraging second-up placing at Moruya in October. Third-up this Keith Dryden/Scott Collings-trained mare won impressively at Canberra on Melbourne Cup Day. Ridden by Brendan Ward, she settled well back in the field and gave them a good start on straightening, but powered to the line to score an emphatic win. There was much celebration in Canberra where she was one of a winning treble for the stable. There was also plenty of cheering at Flemington where a number of the owners were in our party in the Panorama Restaurant. She appears to be in good form going forward, and was scratched from a strong race at Goulburn last Sunday due to a wide gate, and runs again this afternoon (Friday 1 December) in Canberra, but has a wide gate to contend with again, so will need a lot of luck. Australian-bred Maygrove returned to the top of his game at Awapuni in New Zealand on Saturday, capturing the Listed Feilding Gold Cup over 2100m in a gutsy performance. Winner of four stakes races across the ditch, Maygrove has been out of the winners’ circle since October last year, but fought back strongly when challenged in the Gold Cup. 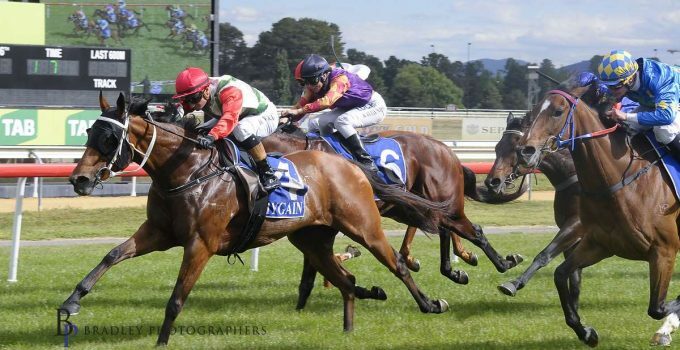 Having no luck at his most recent outing in the Listed Rotorua Challenge Plate, when second up from a spell, Maygrove had to overcome a wide draw at Awapuni, taking up the lead 600m from home and then holding on gamely. “He (Maygrove) had to overcome the draw and a big weight (59kgs), but it was a tough effort from the horse,” an admiring trainer, Andrew Forsman, said after the race. 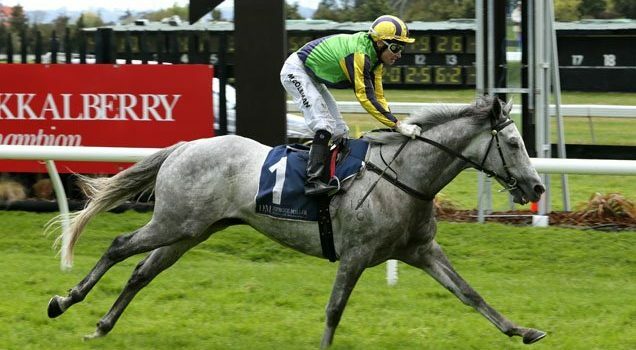 The flashy grey is something of a crowd favourite in New Zealand and has now compiled eight wins – including the Group Two Wellington Cup and Group Two Awapuni Cup – and 15 placings from 47 starts for over NZ$400,000 in stakes. Now a 7YO, Maygrove was bred in NSW by the Laurel Oak Lady Zhivago Syndicate, which is managed by leading bloodstock agent, Louis Mihalyka. “We’ve always had an opinion of Maygrove and were actually the underbidders when he sold to Bruce Perry Bloodstock for NZ$110,000 as a yearling,” Mihalyka points out. “He is by the former Darley stallion, Authorized: a son of Montjeu who won the 2007 Epsom Derby. John O’Shea really liked the horse at the time and said to me that he wanted to train him, but obviously the other mob were keen to buy him too. HOOFNOTE: Mihalyka has an interesting story as to how Maygrove got his name. Bought for $110,000 at Karaka in 2012, accomplished stayer Maygrove (Authorized) took his prizemoney earnings to almost four times that amount with another tenacious performance in Saturday’s $50,000 Listed Ricoh Feilding Gold Cup (2100m) at Awapuni. 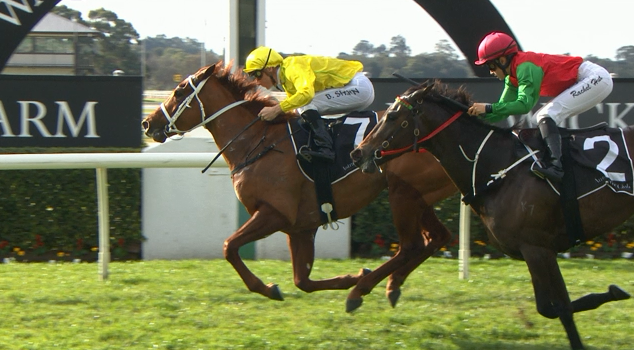 Ridden by Johnathan Parkes for Cambridge trainers Murray Baker and Andrew Forsman, Maygrove trailed the early leader and then made his move as the field rounded the home turn. The grey kicked away and opened up a clear advantage, then stuck to his guns under 59 kilograms to win by a long neck. Raced by Lib Petagna’s JML Bloodstock in partnership with Patrick O’Rourke, Maygrove has now had 47 starts for eight wins, 12 placings and just over $409,000 in prizemoney. This was his fourth stakes win, having previously won the Group 2 Wellington Cup and Awapuni Gold Cup along with the Listed Jakkalberry Classic. Maygrove was bred by the Laurel Oak Lady Zhivago Syndicate. 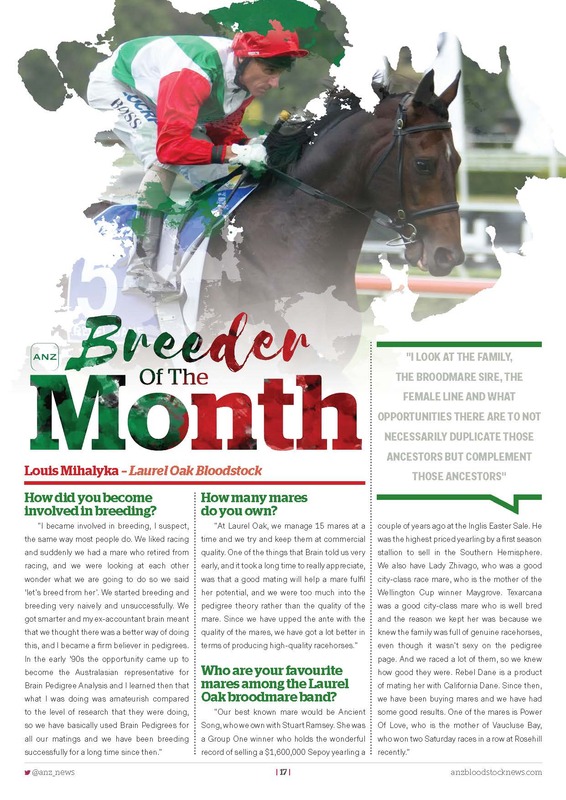 The ANZ Bloodstock News speaks to Laurel Oak Bloodstock’s Louis Mihalyka as they preivew their Breeder of the Month. To read the complete article, click the below image. Bluebloods’ David Bay takes a look at Rebel Dane in his July Stallion Profile. Click the below image to view the complete article. Vaucluse Bay (Al Maher) added a second victory on the day for Waller when he impressively took out a Benchmark 85 (2000m) at Rosehill. 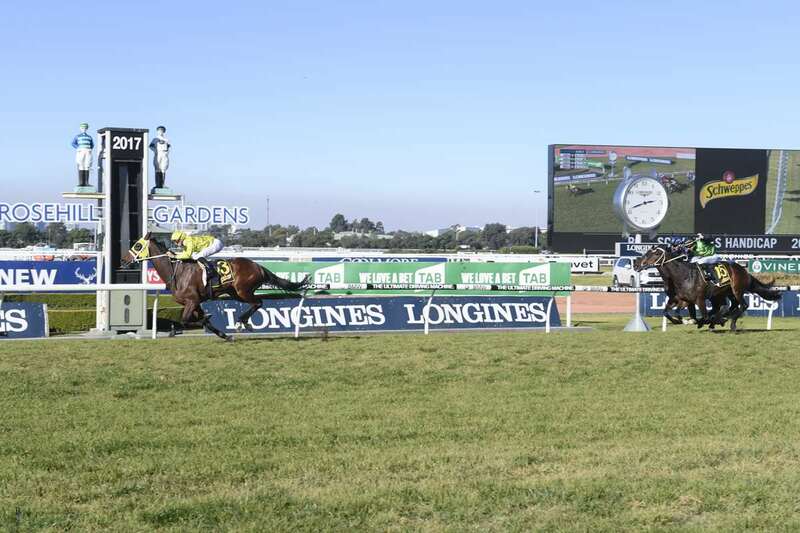 The rising four-year-old gelding came into the race having won a Benchmark 74 (1800m) at the track on 15 July and yesterday he defeated More Than Fabulous (More Than Ready) by four lengths with just a short head back to Life O’Brien (High Chaparral) in third. “He’s come of age this preparation. Today was by far his most impressive win,” Waller said. AccelHaving been knocking on the door in his three runs prior, Accelerato completely bulldozed it down this afternoon at Bendigo to break his maiden in emphatic style for Mornington-based trainer Tony Noonan. Making the win even sweeter was the $28,400 VOBIS bonuses attached to the race which Noonan handsomely collected for long-term stable clients at Laurel Oak Bloodstock. “With Super VOBIS and Gold VOBIS bonuses, this race is worth $51,000 which is hard to get,” said Noonan. “ He has been disappointing on occasions but Brad (Rawiller) was able to just get a sit in behind, settle well and have a good kick. By applying a slight change of tactics, Noonan was quietly confident that Accelerato was in for a change of fortunes if things unraveled as planned. “He’s just been over-racing in his races and racing on nervous energy. We tried hard to get him into a position where he can take a sit. Jumping well from the gates, Rawiller took hold of Accelerato behind a moderate tempo as Legal Mistress crossed from a wide barrier to provide cover for the 3-year-old son of Fastnet Rock who had led in is three runs prior. Tracking through the bend well, a gap opened for Rawiller upon straightening as Accelerato ($4.20) effortlessly quickned under quiet riding before opening up a big margin to score by 7 lengths from Aquifer Mist ($21) and Legal Mistress ($15). “Looking at the race, I’d expected we probably would be the leader but Tony was happy if something would go quick enough, we’d be able to get a sit as it worked out,” said Rawiller after the win. Having run placings in the three starts prior, Accelerato’s maiden win today took his earnings to $54,525 at his sixth career start. He might not have won as many two-year-old races as some of the bigger stables this season but Gary Portelli can still claim bragging rights with the performances of She Will Reign capped by her Golden Slipper triumph. While Lindsay Park, Godolphin, Gai Waterhouse and Adrian Bott and Peter and Paul Snowden lead the charge for juvenile winners, Portelli has racked up 10 including the biggest of all. She Will Reign won four races while Laurel Oak Bloodstock’s Lipizzan can make it three when she steps out at Warwick Farm on Saturday along with stablemate Nicci’s Gold who broke her maiden at Newcastle last month. 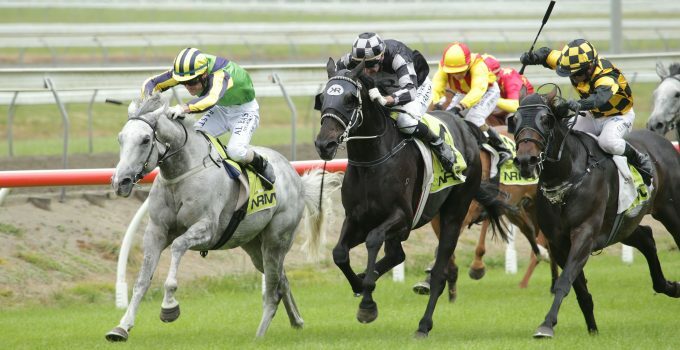 Portelli will return later this week from a short break in New Zealand for a rare Saturday meeting on his home track. 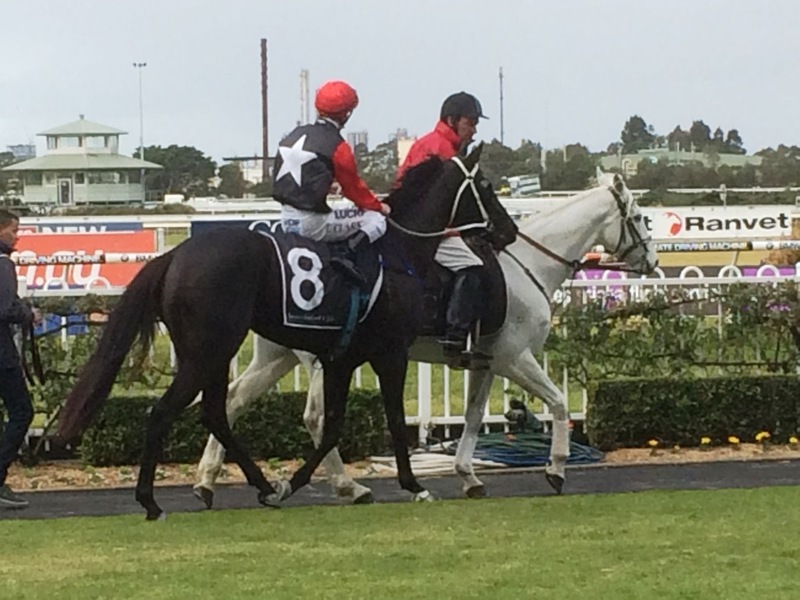 “Lipizzan has always shown ability and her form on wet tracks is a bonus at this time of year,” Portelli said. “Rachel King will ride her again. She’s won two on her and we get to use her claim. “Nicci’s Gold has been a little revelation. “We didn’t expect her to win over 900 metres at Newcastle and then she’s come out and run second on the Beaumont track up there over older horses. Comeback jockey Josh Adams has ridden Nicci’s Gold at her past two starts and will again be aboard on Saturday when she runs over 1200 metres. Sydney’s champion apprentice in 2010/11, Adams spent three years out of the limelight undergoing rehabilitation while serving a disqualification for a positive drug swab. He returned to race riding earlier this year and made his first trip to Sydney on June 10 when he steered The Monstar to win the Listed June Stakes. There were 13 entries taken on Monday for the two-year-old race including the Snowden-trained Star Galaxy who finished third to Lipizzan at Randwick on June 24. While the two Portelli-trained fillies are trying to gain more late-season prize money, She Will Reign has returned to the stable after a break to be prepared for a two-run campaign with the Moir Stakes at Moonee Valley the proposed lead-in to The Everest at Randwick in October. This was trainer Gary Portelli’s description of the two-year-old filly — and he wasn’t talking about his Golden Slipper winner She Will Reign, either. Portelli made the comment after Lipizzan scored a dominant win in the McGrath Estate Agents Plate (1200m) at Royal Randwick on Saturday. “From the first time we started working her she showed ability but I thought this might be short-lived because she is only little,’’ the trainer said. “Even when you put a saddle on her, she seems dopey and quiet, she looks like she is not interested. 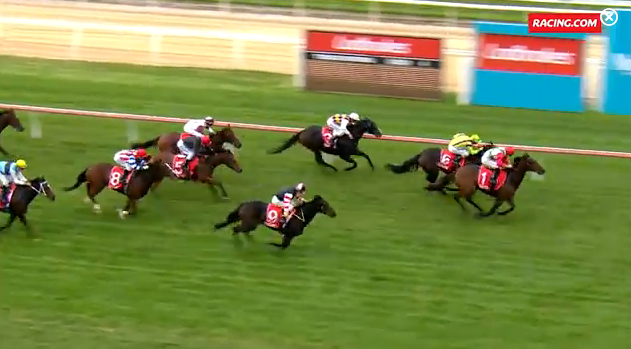 Lipizzan ($4.80) was having her sixth start for the season, scoring her second win (plus four minor placings) when she raced away from early leader Last Starfighter ($3.50 favourite) to win by nearly three lengths with Star Galaxy ($3.60) three-quarters of a length away third. Portelli is renowned as a master trainer of juveniles and revealed he has won 10 two-year-old races this season from a team of only 17 youngsters. “We still have a couple more to come out to the races in the next few weeks, too,’’ Portelli said. 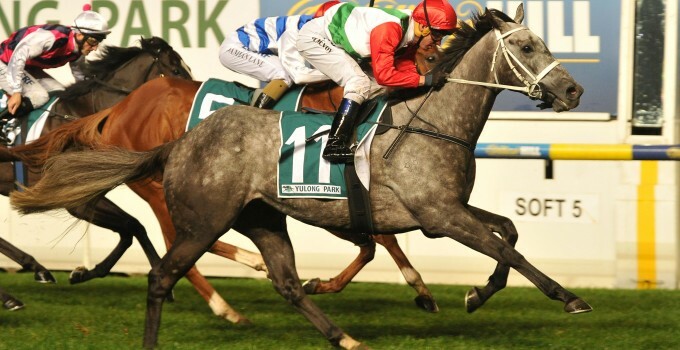 Portelli said he won’t necessarily send Lipizzan to the spelling paddock after her latest win. “I’m a great believer that when fillies are racing well, you keep them going,’’ he said. “She is showing no signs of training and the prizemoney with the BOBs bonuses is so good — she has picked up $74,000 for her owners today. The two-year-old was put in a perfect trailing spot by in form apprentice Rachel King and Lipizzan did the rest, surging past leader and race favourite Last Starfighter. “None try harder than her,” Portelli said. Lipizzan, who has never missed a place in her six starts, which includes two wins, only tips the scales at 420kg and is only 14’2 in height. The victory made it four straight Saturdays in which two kilo claimer King, who is apprenticed to Gai Waterhouse and Adrian Bott, has ridden a winner. “She has done a good job today stepping up in trip. She was able to switch off nicely in behind them and put them away well. She was still a bit green in front as she does get a bit lonely,” King reported upon dismounting. The Gary Portelli stable continued a great run of success with their juveniles at Canterbury on Wednesday with a front running victory for Lipizzan, a $120,000 Inglis Easter purchase for Laurel Oak Bloodstock from the Newhaven Park draft. A brave second in the Listed Woodlands Stud Stakes at Scone when resuming from a spell, Lipizzan was sent out favourite for this 1100 metre maiden despite drawing near the outside. Ridden forward by apprentice Rachel King, the daughter of Sebring quickly worked across to lead and was never headed to win by a length and a quarter. “She’s always shown a lot of potential,” said Gary Portelli. “She drew wide at Scone and fought on strongly, so I always thought if she dropped back to a midweek race she could just win. 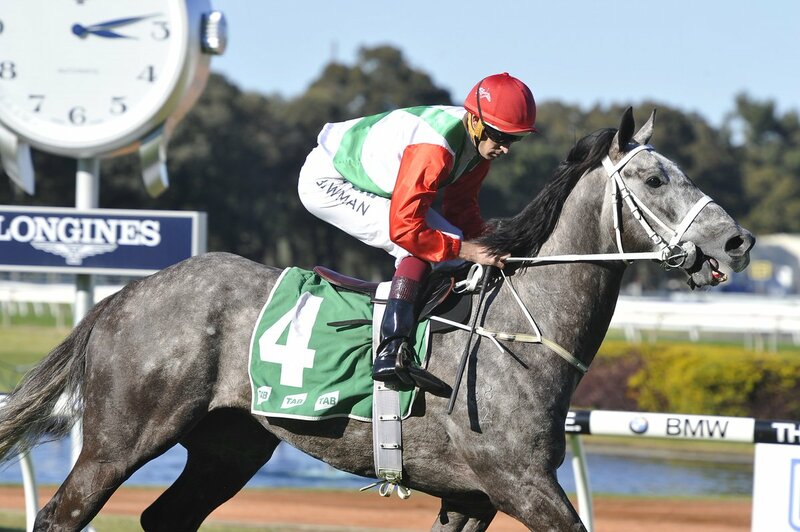 With a win and three placings, Lipizzan has already won over $70,000 for her large group of Laurel Oak Bloodstock owners. The 13th two year-old winner this season for Sebring, Lipizzan was bred by Laurel Oak in partnership and is the first winner for Absolutely Flying, a Commands three-quarter sister to Group III winner Camporella. 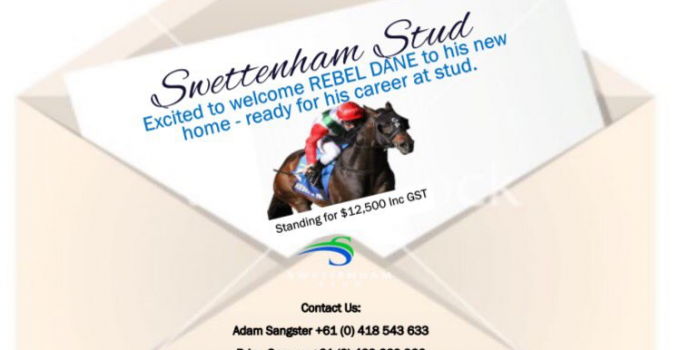 The successful racing career of Rebel Dane, a dual Group 1 winning entire, has concluded and a new phase as a stallion at Swettenham Stud this spring now awaits. While the team at Swettenham Stud is full of excitement at the arrival of the stunning seven-year-old, it has been a sad past week for all at Portelli Racing as they said goodbye to their stable favourite. It was evident by the way Portelli spoke about his old champ, that there was a real sense of respect and awe, looking back at what this horse has accomplished throughout his career. “He was such great flag bearer for the stables, a great booster to staff morale racing at Group level each carnival, and the old saying rings true “you don’t know what you miss till it’s gone,” Portelli said. “Horses like him don’t come around very often, not with his record. He has more wins and placings at Group 1 and 2 level than what most horses going to stud have had starts,” Portelli said. Louis Mihalyka of Laurel Oak Bloodstock, Rebel Dane’s managing owner, reflected on his career and is excited about his future as a successful stallion. 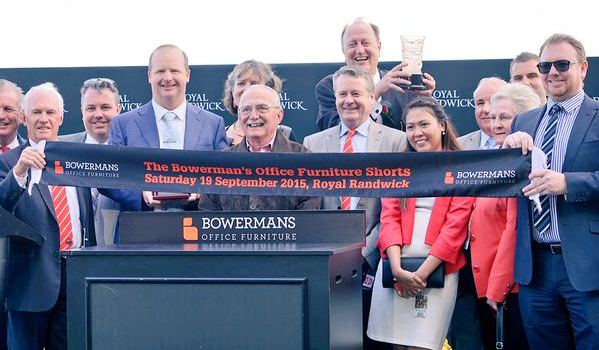 “Having a horse race in Group 1 or 2 company for over 30 starts is an owner’s dream. The fact he was competitive virtually every time he raced made it even more special,” Mihalyka said. “The Manikato Stakes win was the highlight as there were nine Group One winners in the ten horse field. Once he drew well we knew he had a chance and the fact he delivered was a magic moment in life for all of us. Having overcome two serious tendon injuries, it was a delightful sight at Mornington for owners of Mr Optimistic, who stormed his way back into the winners’ circle for local trainer Tony Noonan. With Mr Optimistic resuming from a spell having endured two consecutive tendon injuries over the past 18 months, Noonan was understandably ecstatic with the result. “It’s just such a relief to see this horse back in the winners’ circle because he showed us so much as a younger horse before he sustained two serious injuries,” Noonan said. “Full credit has to go to the owners because they have been extremely patient and understood what we have been trying to do. Slow out of the gates under rider Jake Noonan, Mr Optimistic settled at the tail of the field behind a strong tempo with the younger Noonan remaining ever patient as the race unfolded ahead of him. Stuck behind a wall of horses down the side of the track, Noonan started looking for runs prior to straightening but with the field fanning wide, he elected to go back towards the inside, spotting the leader six lengths upon straightening. When the gap finally opened by the 125m mark, the Mr Optimistic ($4.80) surged through under patient hands-and-heels riding to hit the front and ultimately score by half-a-length from Bisseu ($8) and Bicondova ($15). “This horse has 62 kilos here today so just riding him that way and riding him for a bit of luck was always going to suit him if the luck played its way,” Jake said after the win. “He just came onto the bridle right when I needed him to from the 500 and things just opened up on the inside. “He’s a classy horse on his day. He’s stakes-placed and was just too good. He’s a classic Tony Noonan horse – ridden cold to finish off. “A big thank you goes to the owners because it can be quite frustrating when you’ve got a horse of his ability and you don’t get to quite reach the standard you know he can make. The win was the second of Mr Optimistic’s career having shown promise as a 2-year-old when placed in the Group 3 Hampden before succumbing to consecutive tendon injuries. 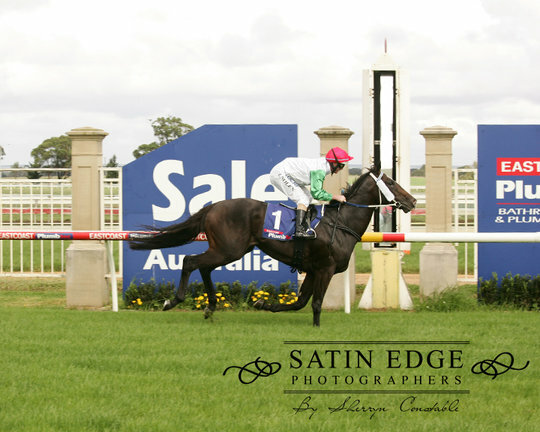 The 4-year-old Domesday gelding was the first foal of Group 3 winner Be Positive, also trained by Noonan for Laurel Oak Bloodstock, and is the older half-brother of She’s Positive (Sepoy) who Noonan trained to win the Adelaide Magic Millions Classic. 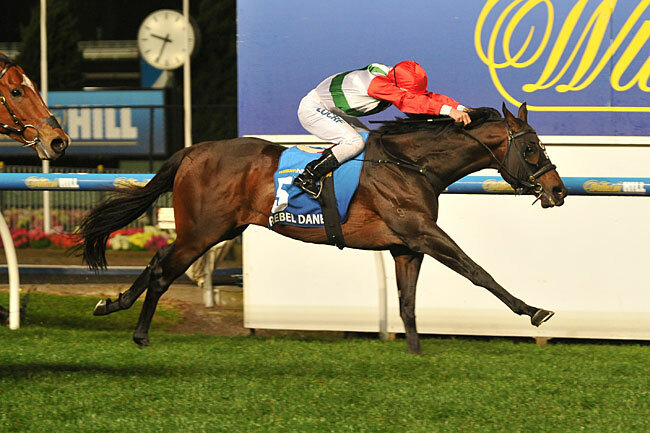 Adam Sangster of Swettenham Stud and the owners of Rebel Dane are delighted to announce that the dual Group One-winning stallion will stand at Swettenham Stud from the 2017 season. Rebel Dane will continue his racing career over the coming weeks in a number of Group One options that will be available to him in Sydney, Brisbane or Adelaide before the curtain comes down on a magnificent racing career. 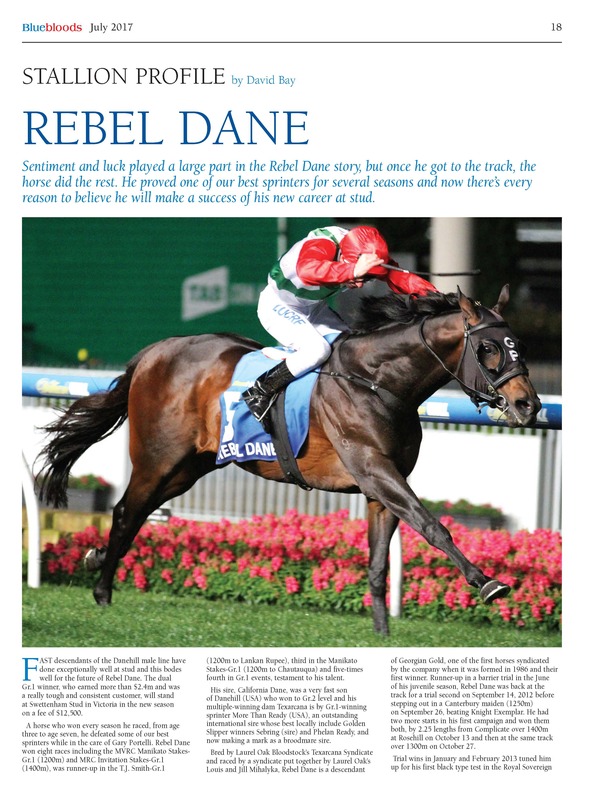 Rebel Dane has raced in top-class company for the majority of his career and his last 30 starts have been in Group One or Group Two company, a testament to his ability and his soundness. Since his 4th career start he has not raced below Group 3 company. His Group Ones win have come in the Manikato Stakes and the Rupert Clarke Stakes. After his magnificent win in the $1million WFA Manikato Stakes last October Rebel Dane contested the Hong Kong International Sprint, where he was beaten just over four lengths after a wide run in a race that was rated one of the best International Sprints in 2016. Adam Sangster was equally enthusiastic. ‘The opportunity to access a dual Group One-winning sprinter is rare for Victorian breeders, especially the winner of one of our iconic sprint races the Manikato Stakes. We were keen to get the stallion for Swettenham Stud and Victoria and were delighted when the owners agreed. He will provide Victorian breeders the opportunity to access a sound, high-class sprinter bred on the successful Danehill/More Than Ready cross that will compliment Swettenham’s existing stallion roster and be ideal for SuperVOBIS. Rebel Dane’s career earnings to date are over $2.4m and his wins aside from his Group One victories include the Group 2 The Shorts, Group 2 Royal Sovereign Stakes and Group 3 Show County. He has also been placed nine times in Group One or Two company highlighting what an exceptional sprinter he is. By California Dane, Rebel Dane is bred on the Danehill/More Than Ready cross and as a Group One sprinter should make an exceptional SuperVOBIS stallion. A service fee for the upcoming breeding season will be announced shortly. Dual Gr1 winner Rebel Dane is not only preparing for the richest race of his career but he’s also eyeing a stud career from the 2017 breeding season. 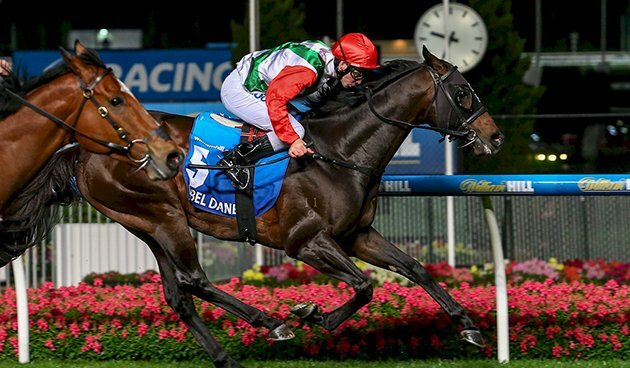 Louis Mihalyka, syndicate manager at Laurel Oak Bloodstock, says Rebel Dane’s owners would support him, but don’t have large-scale broodmare holdings to stand him themselves. He added: “Until now Rebel Dane has stayed in training as his earning potential on the racecourse has exceeded the value of offers received for him. The time has now come to find a stud position for this high-quality racehorse.” Mihalyka estimates a stud could successfully stand him at around $8,000, which would make him an attractive and worthwhile investment in the $1.2 million to $1.5 million range. Rebel Dane is breathing a lot easier these days and so is his trainer. Gary Portelli credits a successful throat operation and a change in his training methods with getting the horse back to Group One-winning form which he hopes he can transfer to the big stage in Hong Kong. Rebel Dane’s win in the Manikato Stakes earned him an invitation to the International Sprint at Sha Tin on December 11. The seven-year-old will tune up for the trip with a barrier trial at Rosehill on Tuesday which will be held on the course proper as a mark of respect for Australia’s lone representative at this year’s showcase meeting in Hong Kong. Rebel Dane took three years from his first Group One win in the Rupert Clarke Stakes to win his second with many near misses in between. ‘He can breathe normally now and he turns up on race day,’ Portelli said. ‘And I’ve got no doubt the way we are training him has helped. He has gone over a few jumps and we’ve been taking him to the beach and the change of scenery has sharpened him up. ‘At the moment he is the best I’ve had him this deep into a preparation. Portelli has no concerns about how Rebel Dane will handle the trip to Hong Kong on December 4, a week before the big race. ‘He’s done many trips to Melbourne and Brisbane on a float so I think a plane to Hong Kong will be much easier,’ he said. A seven-year-old, Rebel Dane has earned more than $2.4 million but attempts to find a suitable home at stud have so far come to nothing. And if a stud can’t be found, Portelli is more than happy to keep him in his Warwick Farm stable. ‘He’s part of the furniture and I hate to think about the day he retires,’ he said. A field of six will take part in Tuesday’s 1000m barrier trial. Gary Portelli, some 25 years ago, was dreaming of training racehorses in the ‘big smoke’ as he worked the nightshift, making pies at a bakery in Orange, a country town 254 kilometres west of the New South Wales state capital, Sydney. That dream became a reality in 1996 when the man who brings recent Group 1 winner Rebel Dane to Hong Kong for December’s LONGINES Hong Kong Sprint set up stables at Warwick Farm, which is still fundamentally west of Sydney but more than 200 kilometres closer. Ten years earlier, the seven-year-old stallion’s managing owner Louis Mihalyka set his dream in place when he abandoned the security of his career as an accountant – also in Sydney – to take on the much more fickle and fanciful world of horse racing by establishing Laurel Oak Bloodstock. “I loved racing from my mid-teens. I worked as a chartered accountant for twelve years after leaving school but left the day before my thirtieth birthday; went on an overseas holiday for seven months and started Laurel Oak on my return, which I had really planned even before I left the accounting job,” Mihalyka. Interestingly, Mihalyka – who bred Rebel Dane – recalls that he wasn’t the only young man then employed with Coopers & Lybrand with a passion for horse racing. “In 1981, when I moved to Coopers (& Lybrand) there was a young university graduate in my audit group. The young graduate was John Camilleri, who bred the champion mare Winx, so that audit group provided the breeders of the two Group 1 winners at the Cox Plate meeting 35 years later,” he said. This year’s HKIR will certainly not be Mihalyka’s first encounter with Hong Kong racing. Each year, he manages a tour group of enthusiastic owners and racegoers generally affiliated with his racing and bloodstock business, to the December meeting at Sha Tin. Indeed it will not be his first visit as an owner. Laurel Oak had an interest in Into The Night who was beaten seven and a quarter lengths into ninth placing behind the all-conquering Silent Witness in the 2003 Hong Kong Sprint and Mihalyka is looking forward to having another ‘crack’ at the sprint title. “Everybody loves travelling to Hong Kong, I certainly do and this year we come with an in-form horse. I understand it’s no easy task to go there and win but Rebel Dane is a very good horse and generally underrated. His asset has always been his devastating dash. He can really sprint for 150 to 200 metres and if he gets the right run in the race, as he did at Moonee Valley, then he can be very effective,” he said in reference to his 21 October Manikato Stakes win. Mihalyka said that to win an international race with Rebel Dane would be especially significant. “We started Laurel Oak with our first horse in January 1986 and had our first winner in June 1987, which was Georgian Gold who is the great grandmother of Rebel Dane, so there’s a great history with this horse,” he said. As to Portelli, his dream has materialised in the shape of major races wins from Group 1 sprints with Rebel Dane and Gold Trail to an ATC Oaks success with Rena’s Lady and this too will not be his first racing trip beyond home shores. It was Gold Trail with whom he travelled in 2010 – going to New Zealand, Singapore and England: the gelding won the G1 Railway Stakes, ran fourth in the G1 KrisFlyer International Sprint and was 10th in the G1 King’s Stand Stakes. “I’m really looking forward to going (to Hong Kong). It will be a great experience. The horse is in great form, he couldn’t have come through his last run any better and we think he can be competitive. “I’ve spoken to Michael Hawkes who went over with Chautauqua earlier this year, to get some insight into how things work in the quarantine stables and he’s been great. You go somewhere new and it’s wise to get as much help as you can. “Back in those days in Orange, in between riding some track work and working at the bakery, I certainly dreamed of going to Sydney to train but I couldn’t have imagined that overseas travel with a horse was ever going to happen. But here we are, bound for Hong Kong and my feeling is ‘why not, let’s have a go,’” Portelli said. It was probably the last thing Louis Mihalyka wanted to hear as he sat eating his lunch last Friday. Attending a special Cox Plate eve function, Mihalyka listened on as MC, Steve Moran discussed Rebel Dane’s chances in the Group One William Hill Manikato Stakes that night. Moran pointed out that Rebel Dane’s previous three efforts in the Manikato had seen him miss out by a cumulative 3.2 lengths … costing Laurel Oak and connections some $1.6 million in earnings. Moran actually said he thought Rebel Dane was good value at the odds, given his record in the race, and now that he had drawn a good barrier. Turned out to be quite prescient as Rebel Dane – who was bred by the Laurel Oak Texarcana Syndicate and is part-owned by Mihalyka’s Laurel Oak Bloodstock – got up in a thriller. Hugging the rail throughout, Rebel Dane surged to the lead turning for home and had enough left in the tank to hold off a fast finishing Fell Swoop. The Manikato lowered the colours on two of racing’s superstars in Chautauqua and Buffering, with the former out until autumn and the latter retiring after a brilliant career that produced seven Group One victories and over $7.3 million in stakes. However, Mihalyka reveals that no immediate plans have been made for Rebel Dane. “As for what happens from here, I’ll have to talk it over with (trainer) Gary Portelli,” Mihalyka adds. “He might be spelled until autumn, but I also got a call from Hong Kong at 7.55am on Sunday about him running in the big sprint race at Sha Tin in December and he’d had his (inoculation) shots by 8.30am! Given that Laurel Oak is the Australasian agent for Brain Pedigree Analysis, Mihalyka was quick to add that Rebel Dane is a “Brain mating” but agreed – on paper – that the pedigree page was unfashionable. Indeed, apart from Rebel Dane, black type is almost non-existent in the first five dams. “Georgian Gold, Rebel Dane’s third dam, was actually our first Laurel Oak winner back in 1987,” Mihalyka recalls. “She ran nine consecutive city placings at one stage and eventually won five races – three of those in town – so we decided to send her to stud. “Her second foal, March To The Sea, was with Kerry Jordan who had a high opinion of him and thought he was stakes class. He won five. The half-brother, Rustaveli, won three as well but a promising career was cut short by injury. “Same with Rebel Dane’s dam, Texarcana, who won three races but was more talented than her ultimate record showed and her career was cut short by equine influenza. It’s not a commercial pedigree by any stretch but it has a lot of very good city-class horses. “Funnily enough, when we did the Brain mating that resulted in Rebel Dane, it came up with two options … California Dane and another Hunter Valley stallion. HOOFNOTE: It has been a big week for Laurel Oak with another of its home-breds in Maygrove winning the Listed Jakkalberry Classic at Rotorua on 15 October, while Rebel Dane’s Manikato Stakes was followed up by Sir Bacchus winning the lucky last, giving Mihalyka a running double at Moonee Valley’s premier night meeting. By Sebring out of the Encosta de Lago mare, Bacchanal Woman, Sir Bacchus is raced in partnership by Laurel Oak and was purchased by Mihalyka at the 2014 Magic Millions National Yearling Sale for $130,000. 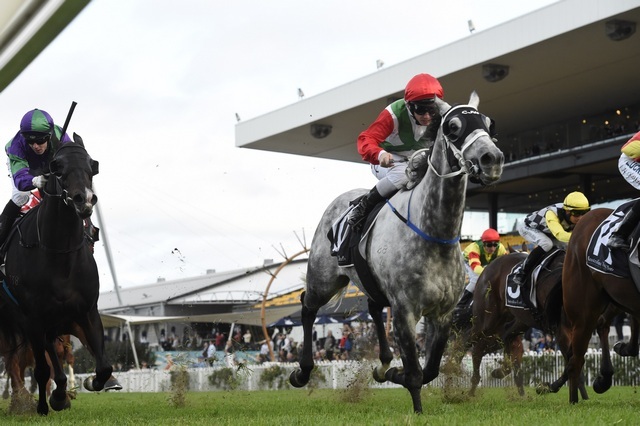 Given a patient ride by Kerrin McEvoy, the Chris Waller trained grey was able to overhaul the leaders and win the 1200 metre open event by a long neck as favourite. A $130,000 Magic Millions National Yearling Sale purchase for Laurel Oak Bloodstock from the draft of Widden Stud, Sir Bacchus has won six of 12 starts earning over $368,000 in prizemoney. He was bred by David O’Keefe’s Lockyer Thoroughbreds and is the first foal of his stakes-winning Encosta de Lago mare Bacchanal Woman. Bacchanal Woman was on-sold last year at the Inglis Broodmare Sale where she was snapped up by Goldin Farms for $340,000. Laurel Oak purchased a Sepoy filly from Bacchanal Woman for $230,000 from the Inglis Australian Easter Yearling Sale this year. 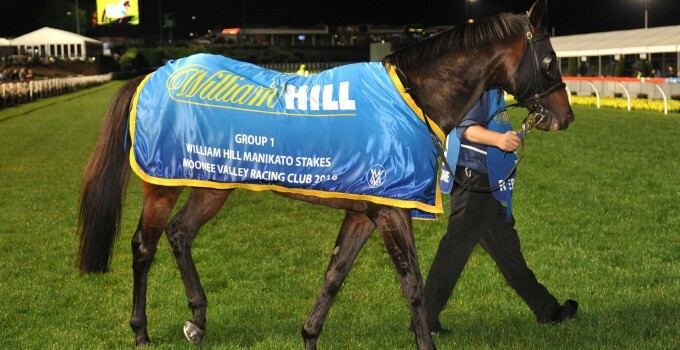 Group 1 Manikato Stakes to Rebel Dane! 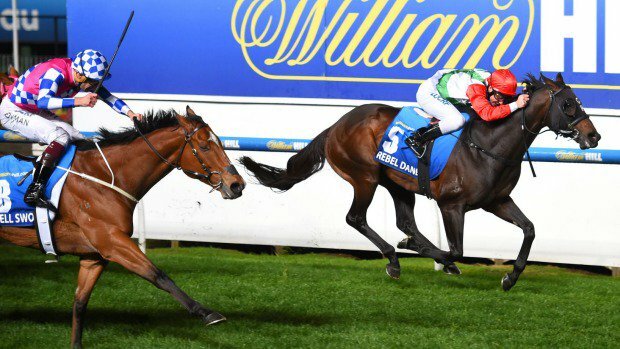 Rebel Dane shocked punters winning Friday night’s $1 million Group I Manikato Stakes (1200m) at Moonee Valley in his fourth attempt. The seven-year-old entire finished fifth in the Manikato Stakes in 2013, fourth in 2014 and third in 2015 before winning and despite having not won in 12 starts since winning The Shorts last September. Trainer Gary Portelli said the easing track gave him confidence. Settled in sixth place along the inside by Ben Melham, Rebel Dane ($61) was able to come through unimpeded along the inside into the home straight and powered home to defeat Fell Swoop ($7.50) by a head with Japonisme ($16) one length away third. “The cut in the ground certainly helped him and he’s always run well in this race,” Portelli said. 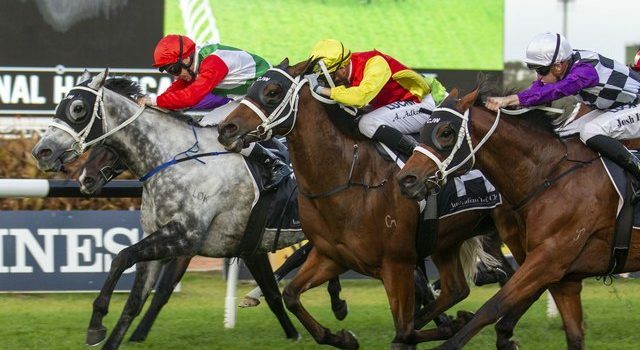 “What a ride – I saw him (Melham) have a look behind him when he tried to push Holler out the way then he cut back to the inside – that’s what won the race. “I knew he (Rebel Dane) still had it in him, the sectionals he ran last start were the best outside of Astern so I said we’ve got to have a go at this race. Portelli said he had been mixing up Rebel Dane’s routine to keep the seven-year-old stallion interested in his work. “We’ve been taking him down the beach, putting him over some jumps, just trying to break things up,” Portelli said. 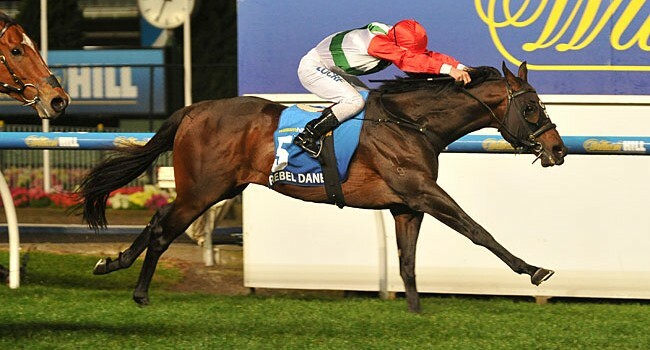 Ben Melham said Rebel Dane enjoyed a trouble-free run. “There was that much room there I was a bit worried the grey (Chautauqua) might have come through there so I had a good look,” Melham said. Maygrove made light work of his topweight of 60kgs to record a strong win in the $50,000 Listed Jakkalberry Classic at Rotorua. The Murray Baker and Andrew Forsman-trained gelding got his New Zealand Cup campaign back on track after the grey had missed two races due to rain-affected tracks recently. Ridden for the first time by Michael Coleman, Maygrove settled midfield, as Admiral and I’llav Bubbles set the pace. Maygrove moved forward to the leaders close the turn then strode clear of the opposition to win by a length and a quarter. Gentil Tonton (S.Spratt) finished strongly for second, with six lengths to Flyinby (A.Schwerin) in third. Maygrove’s winning time was 2:10.35 for the 1950 metres on a Heavy10 track. “He’s a very good horse. He’s been consistent all the way through, especially on left-handed tracks. I wasn’t too worried about the conditions. I looked back at his win in the Awapuni Gold Cup on a heavy track and he won well that day, so I was quite confident today – even with the 60 kilos,” winning rider Michael Coleman said. “He travelled really nicely, and got through the ground well. He possibly got there a bit too soon, but you don’t want to lose any of your momentum in this sort of going,” Coleman added. Maygrove now shares $8 favouritism with the in-form Chris Wood trained galloper Pacorus for the next month’s Group 3 New Zealand Cup. Gentil Tonton is at $14. “He won well today, it was pretty easy in the end with his big weight. We’ll probably only get one more race into him before the Cup – it will probably be in the Metropolitan (2500m), then the New Zealand Cup (3200m) a week later,” co-trainer Murray Baker said. The six-year-old has now had 36 starts for seven wins – including three stakes races. 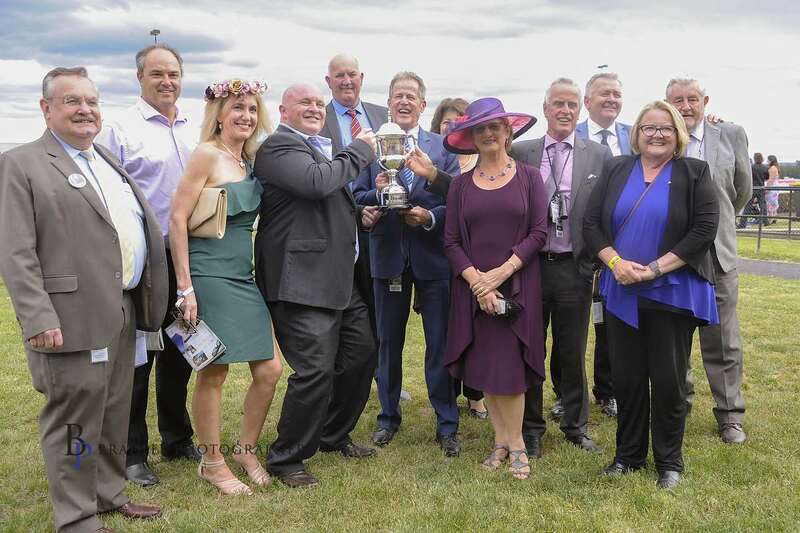 Along with Saturday’s win, was last year’s Wellington Cup (Group 2) the Awapuni Gold Cup (Group 2), and with 10 placings has earned over $340,000 in prize-money for owners Lib Petagna and P W O’Rourke. 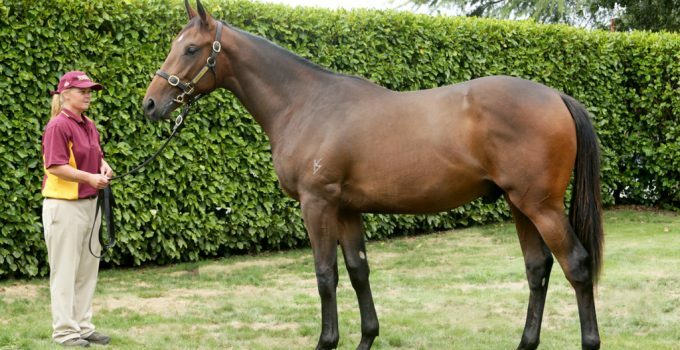 Bruce Perry purchased Maygrove for $110,000 from Haunui Farm’s draft at the 2012 Karaka Select Yearling Sale where the son of Authorized was offered on behalf of the Laurel Oak Lady Zhivago Syndicate. 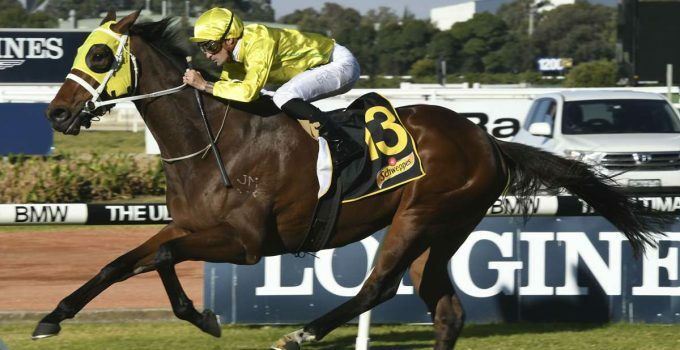 Sir Bacchus captured his fifth career win when resuming in a 1200-metre benchmark 85 handicap last month at Rosehill. The flashy grey will start in an identical race this Saturday, only this time he will be asked to shoulder 61.5kg as opposed to 59.5kg. A 2kg rise at the top end of the weights is of some concern to rider Hugh Bowman but Sydney’s leading jockey has no doubt in the horse’s ability. “He has got a bit of weight,” Bowman said. Having carried a minimum of 57kg at eight of his nine career starts (56kg on debut), Sir Bacchus could be entitled to some weight relief in the coming weeks. “I’m sure he’ll make it to stakes company but I just don’t know where he’ll fit in,” Bowman said. “He might be a horse that could be better in a really good race with no weight than sort of going through that Listed/Group III stage. “I just think he might be a horse that could pop up in an Epsom or possibly one of those Group I handicaps in Melbourne and he’d get in really low. Early punters baulked at Sir Bacchus’ opening quote of $2.20 which has since eased to a top price of $2.50 with Sportsbet. The undefeated Bullrush, trained by Hawkes Racing, is shaping as Sir Bacchus’ biggest danger, quoted a $3.60 second favourite. Racing NSW and the Australian Turf Club today announced that as of 1 October 2016 the minimum prizemoney for Saturday metropolitan races will increase to $100,000 per race. 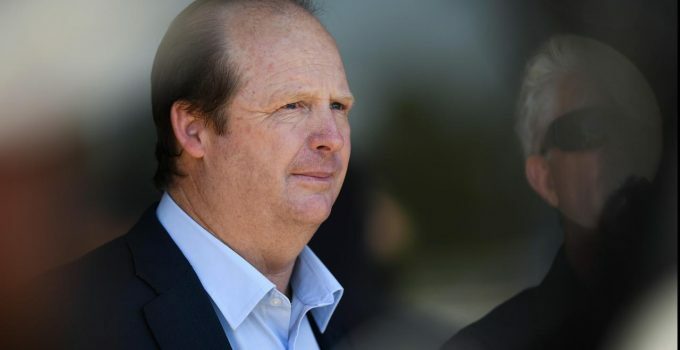 “This increase headlines several prizemoney initiatives totaling almost $53 million annually which has been announced this year, capping off a surge in NSW prizemoney over four years,” said Racing NSW Chairman, Mr John Messara AM. “Today’s announcement is a further step towards achieving a vital component of Racing NSW’s Strategic Plan, intended to financially stimulate the NSW Thoroughbred Racing Industry. “In 2012, total NSW prizemoney was $118.9 million. Following today’s announcement, I’m delighted to advise that annual prizemoney in NSW will be more than $204 million, an increase of $85 million over that time. “These increases are entirely sustainable and are fully-funded from the proceeds of the sale of digital media rights, Race Fields legislation fees and parity,” Mr Messara added. * Metropolitan Saturday minimum prizemoney increasing to $100,000 per race or almost 18% on 1 October 2016 from $85,000 per race. * Provincial minimum prizemoney increasing to $30,000 per race or 36% on 1 October 2016 from $22,000 per race in June 2016. * Country TAB minimum prizemoney increased to $20,000 per race or 33% on 1 July 2016 from $15,000 per race in June 2016. * Country Sky 2 minimum prizemoney increasing to $10,000 per race or 25% on 1 October 2016 from $8,000 per race. * Addition of an eighth race to 20 selected midweek and night ATC race meetings from 1 October 2016, injecting a further $800,000 in prizemoney. * Inclusion of an $80,000 feature race on ATC night meetings from 1 October 2016, injecting a further additional $320,000 in prizemoney. * Group 2 race prizemoney increasing to a minimum of $200,000 per race or 14% on 1 October 2016 from $175,000. * Group 3 race prizemoney increasing to a minimum of $150,000 per race or 20% on 1 October 2016 from $125,000. * Listed Race prizemoney increasing to a minimum of $125,000 per race or 25% on 1 October 2016 from $100,000. * Inclusion of a $150,000 feature race on selected metropolitan meetings. * BOBS bonuses of $20,000 to be added to two and three year old Listed races from 1 October 2016. * Country and Provincial Championships qualifying heats to be run for $150,000. * A fortnightly $40,000 provincial maiden race on selected meetings from 1 October 2016. * Thirty $40,000 country restricted maiden races on selected Showcase meetings from 1 October 2016. Australian Turf Club Chief Executive Officer, Darren Pearce said the depth and breadth of today’s announcements for Sydney racing were among the most significant in the Club’s history. 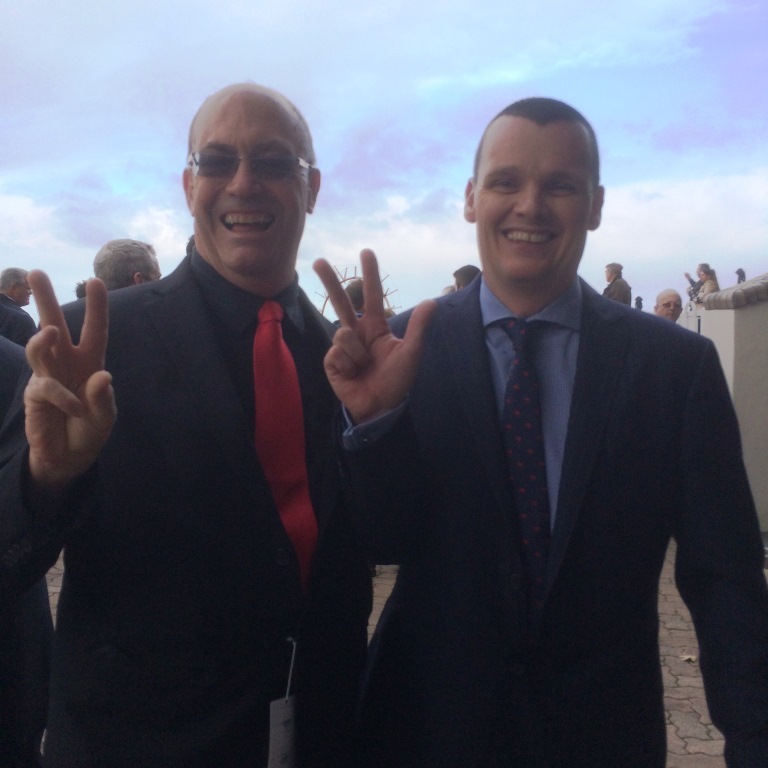 “The ATC is fully funding more than $4 million to increase all metropolitan Saturday races to $100,000, setting the new benchmark in Australian Racing,” Mr Pearce said. “All Stakes races will benefit from newly increased minimum prizemoney levels, and new feature races will be added to Night Racing fixtures and the Melbourne Cup Race Day at Royal Randwick. “These prizemoney increases are just one part of the ATC’s focus and long-term strategy to grow a stronger and sustainable future for Sydney racing for decades to come. The equal highest earning BOBS winner for the past season, consistent Sebring four year-old Sir Bacchus returned from his winter spell with a late surging victory at Rosehill on Saturday. 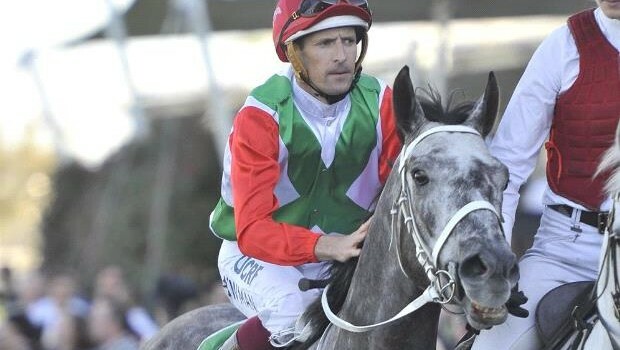 Given a beautiful ride by Hugh Bowman, the Chris Waller trained grey was able to overhaul the leaders and win the 1200 meter Benchmark 85 event by half a length under 59.5 kg. “It was a well-timed ride by Hugh Bowman to say the least and the horse looks like he’s come back stronger,” Waller said. A $130,000 Magic Millions National Yearling Sale purchase for Laurel Oak Bloodstock from the draft of Widden Stud, Sir Bacchus (pictured Steve Hart) has won five of nine starts earning over $300,000 in prizemoney. Bacchanal Woman was on-sold last year at the Inglis Broodmare Sale where she was snapped up by Goldin Farms for $340,000 and has since produced a Sepoy filly for her new owners. While most at the Warwick Farm barrier trials on Friday were expecting Rebel Dane to set tongues wagging, it was in fact his stablemate Tuscan Falls that produced the goods. The veteran of only one prior trial – back in October where he finished third, two-year-old Nicconi gelding Tuscan Falls impressed all at Warwick F arm with a very impressive performance in his trial. Jumping from the middle of the line in Heat 11 over the 800m, jockey Brenton Avdulla hunted him forward to take the lead. Sporting a pair of blinkers, the gelding maintained his lead of about a length until the home turn. As they came wide when teh field rounded the home turn, Avdulla asked his mount for more, and he really extended to take the heat by an impressive three length margin from the Clarry Conners-trained He’s A Given. 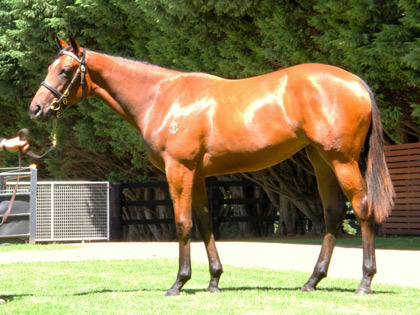 Secured at the 2013 Inglis Easter Yearling Sale as Lot 473 from the draft of Turangga Farm, Tuscan Falls (pictured below as a yearling) is the first living foal out of the winning General Nediym mare Queen Of The Falls, herself a half-sister to the Group Two -winning, Group One placed Elite Falls, both daughters of the Group Three-winning Danehill mare Niagara Falls. Trainer Gary Portelli was suitably impressed by the rising three-year-old and will wait to see how he pulls up before he decides on which direction to take. Earlier in the day, Laurel Oak Bloodstock’s Group One winner Rebel Dane was in action, contesting Heat 7 over 800m. 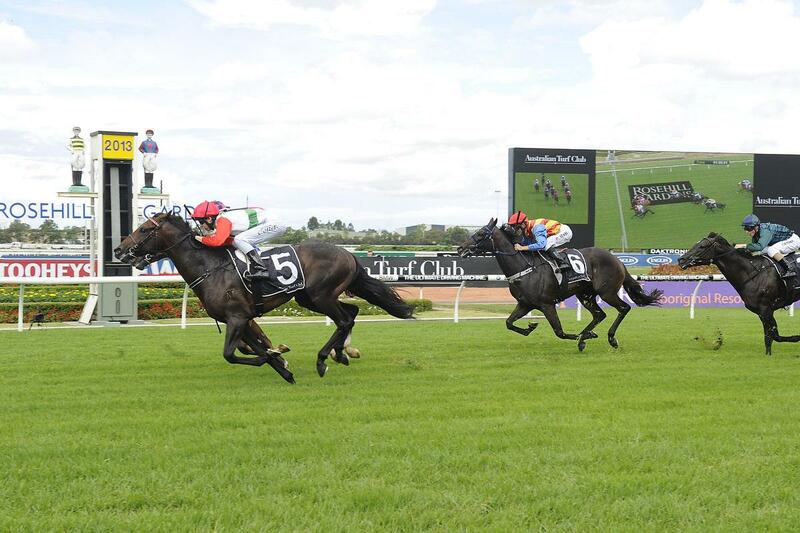 Ridden by Hugh Bowman, Rebel Dane settled out wide in a mid-field position during the run. Pulled even wider on the turn, he worked home well to take third, beaten a head x half head by Celtic Prince and Dear Demi with the beaten brigade including Laser Hawk, Bull Point, Tougher Than Ever and My Kingdom of Fife. With Portelli also indicating that since Rebel Dane is older, he requires more work to get fit. In what was a great day at the trials for the Laurel Oak Bloodstock horses, we really look forward to the coming weeks and months of the Spring Carnival when we see these two, plus a host of other runners head to the track! Part-owned by the Laurel Oak Shamrock (Mgr: L J Mihalyka, Ramsey Pastoral Company Pty Ltd (Mgr: S B Ramsey) Syndicate, trainer Peter Moody is expecting a bright Spring Carnival from the lightly raced Better Land after the Shamardal colt was an impressive Doomben barrier trial winner on Tuesday. 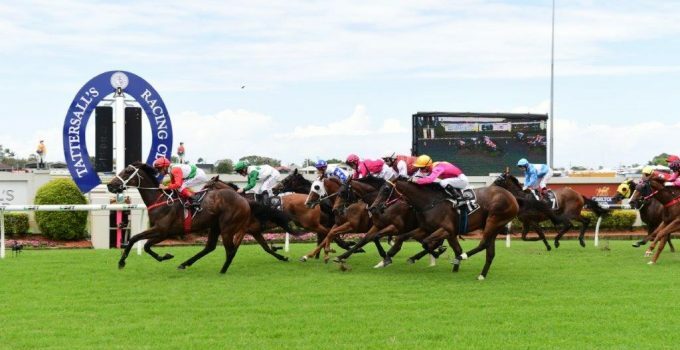 Risinng three year old Better Land and stablemate Dissident have been spelling in Queensland and both pleased Moody with their barrier trial efforts. Leading Brisbane jockey Michael Cahill rode both the Moody runners and gave good reports following their respective outings. While Dissident ran second to the Steve O’Dea trained Itchintowin in the 1000m Open trial, Better Land proved too strong for the Toby Edmonds trained two year old Life At Sea in their 1000m trial. Moody has high hopes for Better Land and expects him to perform well against the top class three year old during the Spring Carnival. 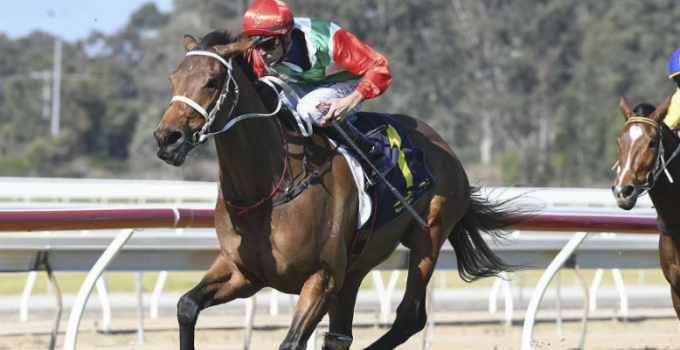 “He is a nice horse and he might have a start in Brisbane before we bring him back south. I would be looking at some of the nice three-year-old races for him,” Moody told AAP. As Moody does with a lot of his youngsters, he takes them to the country tracks of Victoria to let them gain some experience and confident and more times than not they return home with a win next to their names. Better Land was no exception and at his only race start was able to record a comfortable three lengths win on a heavy track in an 1100m Sale Maiden on April 6 before heading for a Winter spell in Queensland. Moody was also happy with the effort of Dissident who will head back to Sydney and then Melbourne with his ultimate goal being the Group 1 $3m Sportingbet Cox Plate (2040m) at Moonee Valley on October 25. 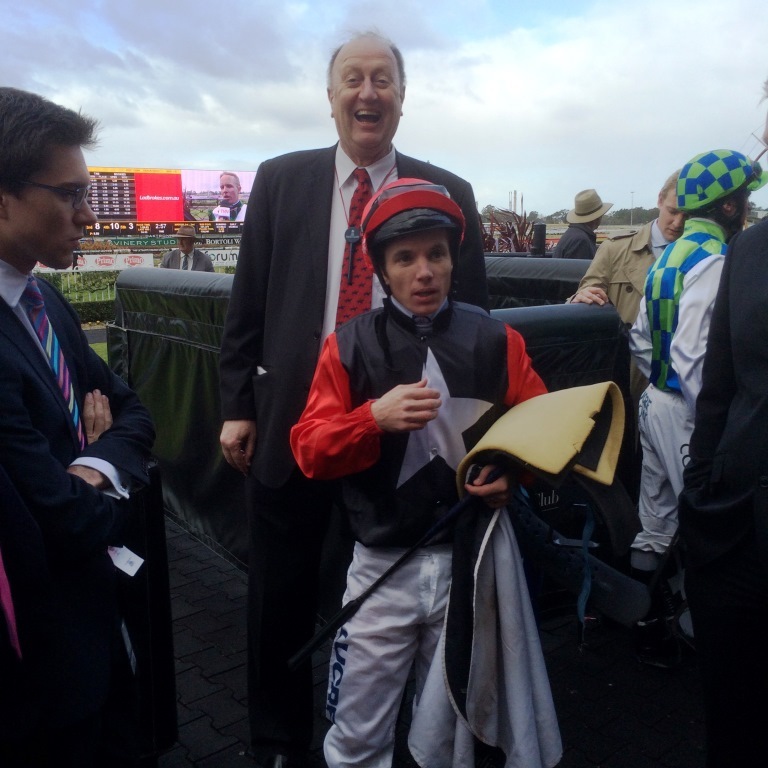 “Michael Cahill rode him in the trial and he was also happy with the way he went,” Moody said. Rebel Dane is set to trial at Warwick Farm on Friday and his little sister will make her debut at Canterbury on Wednesday. 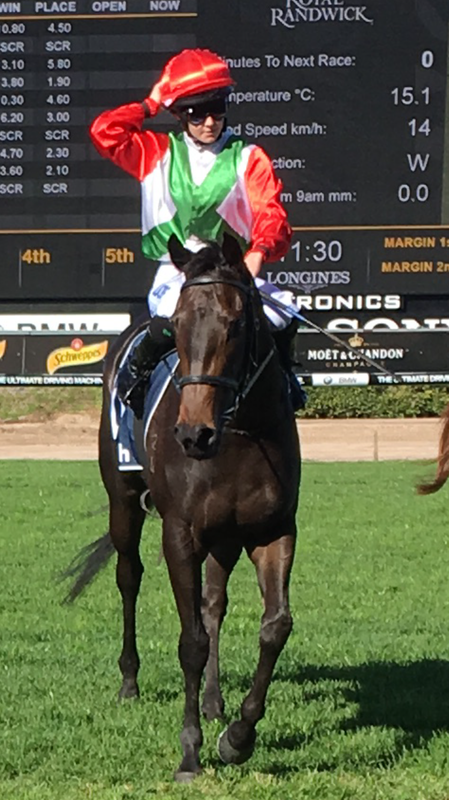 It is an exciting week for the connections and while trainer Gary Portelli is pleased with Texardini, he feels it would be a pleasant surprise if she can emulate her older brother and win first-up over 1250m. “Texardini is certainly not as sharp as him (Rebel Dane), she is a horse who I think will get better over longer distances, but not many are as quick as him,” Portelli said. “She has her fair share of ability but I would like to see her step up in distance before we got any confidence about her. “She gives me the impression she unwinds more than let down quickly. Tommy Berry has been booked to ride Texardini in race two at Canterbury. 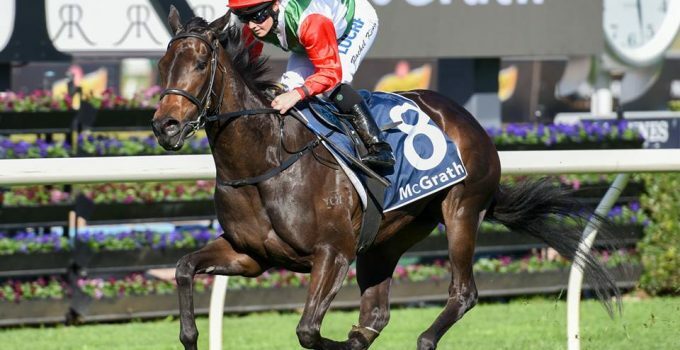 Rebel Dane has had a little freshen since his seventh in the Stradbroke Handicap and is due to resume in the Missile Stakes at Royal Randwick on August 9. Following a sharp gallop on Tuesday morning, Rebel Dane (pictured above) will trial at Warwick Farm on Friday with Hugh Bowman to ride. 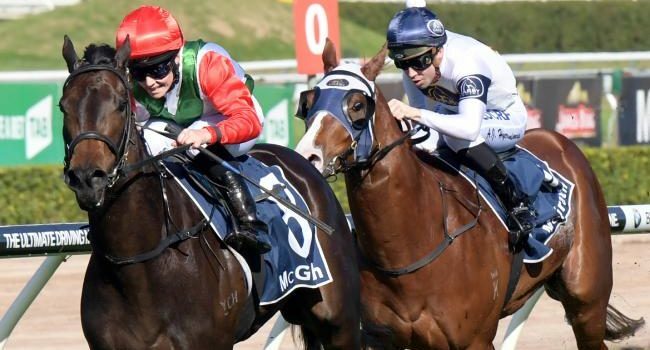 “He had a gallop this morning, he ran half a mile in 49 seconds, he ran home his last 600m in 12.5, 11.2, 11.2 on the grass by himself,” Portelli said. “He hasn’t lost any speed that is for sure. “Hugh Bowman will ride him in the trial and I’m hoping he can stick on for the Missile Stakes and the Memsie Stakes. “Basically I need a jockey who will commit to both races and hopefully once he rides him on Friday he will be happy to be aboard. “He will have the two runs and then a little freshen up, and no doubt we will look at the Manikato again. “He is the type of horse who is explosive for his first two runs. 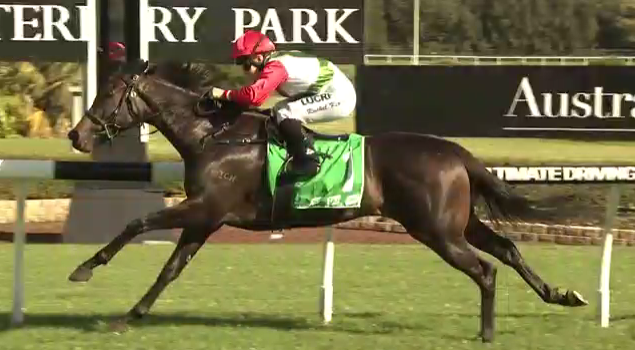 Having broken her maiden last time out over 1200m at Wyong, out Lonhro filly Supreme Joy was sent straight back to town by trainer Joe Pride to contest Race 5: Ladbrokes.com.au Handicap over 1200m on Saturday at Rosehill Gardens. Starting one of the outsiders in the field, jockey Tim Clark gave the filly a very good run, and when the it was time to get her mind on the job she seemed to take a little to make her run, but she then knuckled down and came with a strong run late along the inside to take third, beaten two lengths by the Gerald Ryan-trained Runaway Star with the Bjorn Baker-trained Coolring in second. With seven placed efforts from nine starts to date, the Laurel Oak Bloodstock Pty Ltd, Mr P J Duggan, Mr A F Hackett, Mr P L Nottage, Mr R Ward A M, Mr T A Brown, Mr B Carlstein, Mr E H Crethar, Mr M K Graham, Mrs A M Mcgrath, Mr A I Grant-Taylor, Mrs N L Grant-Taylor, Mr G A Pointon, Mrs A Blewman, Mr N Macdonald, Mr K Macdonald, Mr P T Grady, Mr W R Hayden, Mr W A Chalker-owned filly showed she clearly has the ability to perform at Saturday level and we look forward to another showing when she next heads to the races.